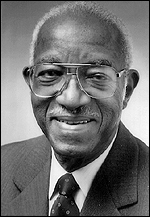 We are in the middle of processing the John Hope Franklin Papers, and it has been inspiring to see Franklin’s wide range of intellectual interests and community engagements. He was a very busy man! 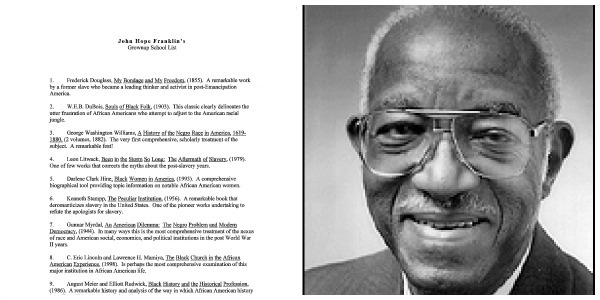 One recent discovery, mixed in with folded programs and family correspondence, is Franklin’s “Grownup School List,” an all-encompassing list he created of must-reads in African American history. Always a humble scholar, he omitted his own monumental works. We’ve reproduced the Grownup School List here, along with Franklin’s annotations. You can find all of these books, along with Franklin’s own extensive scholarship, online or in the Duke Libraries. Post contributed by Meghan Lyon, Technical Services Archivist. This is the second in a series of posts on interesting documents in our collections to celebrate Black History Month. "I Have No Right To Be Silent"
I believe it would be of great interest to the Rubenstein Library, black alumni, professors, and students, and the Duke community in general to know that Professor Franklin’s support and encouragement, and that of his son, John, were instrumental in the success of the ten-year project to create the permanent, ten-foot, bronze father-and-infant “Behold” Monument overlooking the tomb of Dr. King at the King National Historic Site in Atlanta, Georgia (unveiled by Mrs. Coretta Scott King on January 11, 1990)and the acquisition of a separate casting of the “Behold” infant for the permanent collection of the Smithsonian Institution’s American Art Museum. Kindly contact Professor Joel Fleishman, Ms. Valerie Gillespie, Ms. Sterly Wilder, Mr. Scott Lindtroth, Mr. Bob Bliwise, or myself for additional information, photographs, and documentation on the “Behold” Monument which has been recognized internationally as among the most culturally and historically significant works of fine art dedicated to Dr. King in the United States.